We begin reflecting on the Gospel for this week, Matthew 15:21-28 about the Canaanite woman, with an illustration for the Biblical text by a Coptic Monk. The writing is in Arabic, a Semitic language close to Jesus’ own language of Aramaic. And we begin here because it is so important to understand that Jesus spoke and thought in his own language, Aramaic and that Aramaic is full of idioms and metaphors that we can hardly understand in our language and our times. Indeed as we try to follow Jesus in his own language many of our understandings are too literal and off base. Sometimes it seems impossible that we can even know what he said let alone what he meant. But it is worth the effort to allow Jesus’ language to enlighten us. For that it does. Naskh is the caligraphic style for writing in the Arabic alphabet that the biblical text is written in for this manuscript. a project of the Vanderbilt Divinity Library, Nashville, TN. Credit also goes to the website textweek.com. 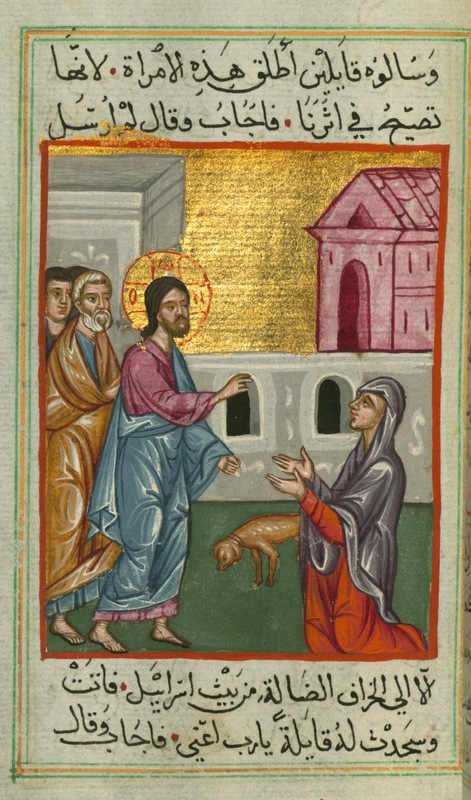 If we take Jesus literally here, it seems that he is calling the Caananite woman a dog-but he is not. In Aramaic ” to take the children’s bread and cast it to dogs” (Matt 15:26) means “”sharing the truths of Judaism with pagans”. ( George Lamsa, Idioms in the Bible Explained,Harper and Row, 1985:53). Jesus has literally crossed the border here going from Jewish land to Gentile/pagan territory where the worship of many gods is prevalent. It is also where the Canaanites live, age-old enemies of the Jews. These are two groups that historically despise each other. The struggle here is monotheism vs. believing in many gods along with lots of violent historical baggage. But let us note: Jesus,not the woman crossed the border. Although his mission was to reach out to lost Jews, he was entering foreign territory to do this. Perhaps it is like looking for fallen away Catholics or Christians anywhere but in the church, not giving up on them,seeking for them. So he is surely not surprised when a woman of that land seeks to engage him. Note first that she is a woman. Rabbis were not to speak with women in general. Orthodox Jewish men to this day do not engage women publicaly. But Jesus has already spoken of God and God’s reign in feminine terms as the woman putting yeast in the bread,(Matt 13:33) and healed the bleeding woman and raised the dead girl( Matt 9:18-25). Matthew’s Gospel records that many women followed Jesus and cared for his needs(Matt 27:55). Perhaps word about what Jesus did and his acceptance of and concern for women had already spread above the Northern border of the Galilean district where Jesus lived and preached and emboldened her. This Canaanite woman is full of hope and belief and sheer guts. She will break with any customs and take any risk to get Jesus to heal her daughter. He does not immediately engage with her because he says that it is not what he came to do. And when he finally responds to her persistence he is saying to her in effect, your people believe in many gods, what could you want of me? She acknowledges him kneeling and using Messianic terms saved for prophets and royalty, “Lord, and Son of David” . In some ways this woman is closer to understanding who he is than his disciples who urge him to send her away,to get rid of her. Jesus is not getting rid of anybody. They still do not get that in the final analysis all are welcome in the reign of God. Once again Jesus surprises us, as she quips with him about the idiom equating pagans with dogs, saying she is willing to take the crumbs under the table, Jesus applauds her great faith and healed her daughter from that very moment. And in doing this Jesus once again affirms the best of Judaism as is stated by the prophet Isaiah(56:1,6-7) “the foreigners who join themselves to me, loving the name of God…these I will bring to my holy mountain…for my house shall be called a house of prayer for all peoples” (TIB and NAB). The Responsorial Psalm, 67:2-8 affirms that God wants all nations on earth to be glad for the justice of God is for all people. Jesus is constantly including everyone, Samaritan, Canaanite, Jew and Gentile, women and men, gay and straight, children and elders,healthy and ill, all people in the love of God. We remember well that it is the Samaritan hero who saves the beaten Jew on the road and the Samaritan woman goes and tells the gospel. Jesus is truly inclusive while many of his followers are “line drawers” who establish in-groups like themselves and exclude all others. Jesus did include the Canaanite woman. Jesus includes all. As Paul addresses the Roman church community(Romans 11:29,32) he addresses the Gentiles telling them that God’s gift and call are irrevocable and for all. to encompass the outsiders in their culture. The lesson is the same for us. Who are the outsiders now? and had married another man. refused asylum to Central American children fleeing from oppression. calling him names, belittling him mercilessly. 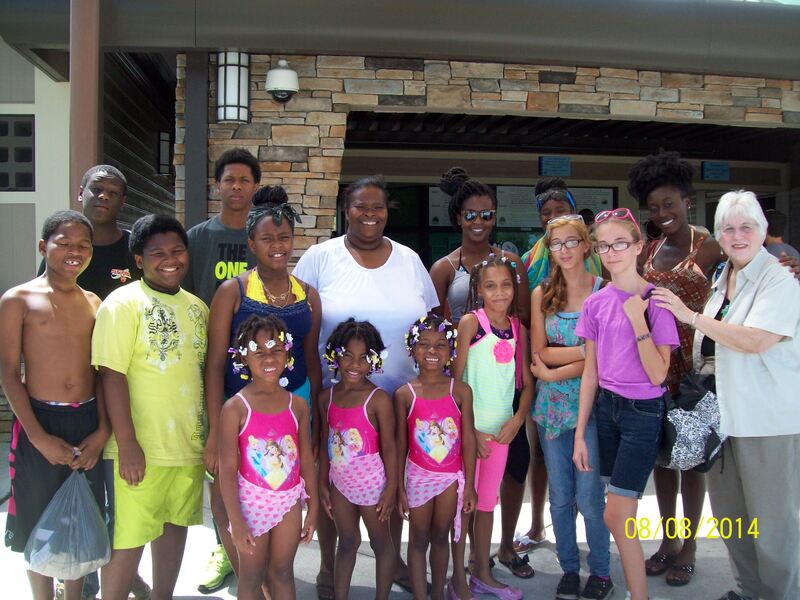 because a black family bought a home nearby. what they look like, how they talk. How do we treat the people in our lives who are different from us? Today’s scriptures give us some pointers. those Gentiles who embrace the Way of Jesus. than they are of God. so do the examples of inclusion and acceptance. to get to know each other at a supper at her home. and asks him to sit at his table for lunch. to work inside the factory instead of in the fields. to welcome their new neighbor into the neighborhood. And so we need to reflect in our own lives: where are we drawing the lines and excluding others. And then ask “what would Jesus do”? Más de 50 personas han leido tu homilia de este Domingo. Es uno de mis textos favoritos. Una mujer capaz de mostrar a Jesús el camino del Reino! Que bueno! Se aparece que es un texto dificil, pero no es!